In the last installment of the A-to-Z WOM (word of mouth) series, we took a look at how the proliferation of social media adoption has transformed the way in which we share information, and offered some advice to harness this trend. In this final installment, we’ll analyze a handful of word of mouth marketing (WOMM) campaigns, using proven tactics, and offer up some takeaways that can be applied to supercharge your company’s marketing in 2013. If you’ve been paying attention to the previous two installments, you already know that WOMM can be an extremely powerful consumer motivator. Whether your goal is to drive loyalty, awareness, customer acquisition, or sales (more than likely, all of the above), there are simply no better marketers in the world than the customers who already love your brand. The reason boils down to the simple fact that we trust our peers far more than we trust advertising. We want the whole truth and nothing but the truth about a brand, product, or service, and when we’re getting an unbiased endorsement from a friend, it will always be the voice that rings loudest and truest amongst a sea of loud-mouthed marketers. So what’s the best way to get your advocates talking? Unfortunately, there’s no silver bullet in WOMM. Every brand is unique and can only truly discover their optimal marketing mix through constant experimentation. What can be said for certain, however, is that – in our perpetually connected society – if WOM does not currently occupy a share of your marketing strategy, it’s time to figure out where it should or you risk getting left in the dust. Consider the following examples of three unique WOMM campaigns, each applying innovative tactics that we can all learn from. In a list of notable WOMM campaigns, we’d be remiss not to mention one of biggest viral hits of the past year, the Dollar Shave Club (DCS) video. Spotting a gap in the male grooming market, Dollar Shave Club set out to introduce the world to its low-cost, subscription-based service with a quirky video to boost awareness and encourage sign-ups. With close to 10 million views to date, the video has been hugely successful in introducing a new company to the world. Surely, in a pre-social world, the video still could have been a hit, but it would have cost the start-up a fortune (that they likely did not have) to run expensive television spots. Instead, DSC relied on developing a uniquely humorous voice, and a great offer, to encourage WOM and sharing across social networks. The video spread like wildfire with 75K Facebook Likes and 50K Tweets to put the previously unknown Dollar Shave Club on the map for good. Takeaway: Attract attention to your campaign with a unique message, and a delivery mechanism that will encourage organic WOM. While a slick, viral video may not be within reach for all companies, Dollar Shave Club’s success shows us that WOM – particularly on social networks – is critical to any WOM campaign. For our second example of WOMM done right, we’ll take a look at Roku, the leader in streaming entertainment devices for television, whose powerful social marketing program was met with impressive results. Through customer research, the company discovered that 25% of its customers bought a Roku player based on a referral from a friend or family member. With this knowledge, the company launched a referral marketing program to reward customers for sharing their enthusiasm about the product. Also recognizing that more than 80% of its customers were Netflix subscribers, Roku chose to include a free month of Netflix for every friend referral that resulted in a purchase of a Roku product. Roku made it effortless for customer advocates to share with friends via easy-to-use email, Facebook, Twitter, and URL sharing tools that would track individual performance. 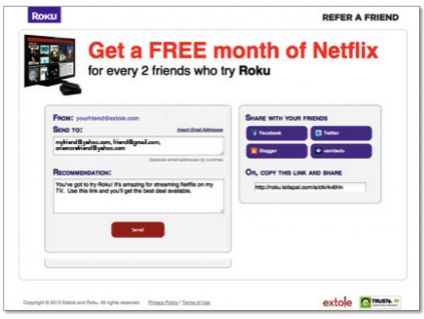 When a referred friend makes a purchase from the Roku site, customer advocates receive email notifications, encouraging repeat participation. Results were impressive and, over the course of 6 months, Roku drove 10,000 new customer referrals per month and increased customer-based referrals by 30%. The program generated more than $250,000 in revenue through 40,000 participating customer advocates! Roku’s success is not only an example of WOMM in action, but a great example of how offering the right incentive, that resonates with the right customer base, can make all the difference! Takeaway: Amplify your WOM campaign by integrating incentives for participants to share with friends and make it effortless to do so where they’re spending the majority of their time – on social networks. Hertz’s “Share It Up” campaign is a shining example of a company using innovative strategies with WOMM. The well-known rental car company chose Facebook as the vehicle to launch a program where participants received a $15 coupon in return for sharing the promotion with friends. Where the plot thickens (and the innovation begins) is the fact that when subsequent friends share the offer, the original participant’s coupon accrues greater and greater value. What makes this offer stand out is that it’s not only offering a benefit in return for sharing initially, but also an incentive to encourage friends to share as well. And a viral WOMM campaign was born. By adding an element of gamification to the mix (1 friend’s share = $25, 3 friends’ shares = $30, 5 friends’ shares = $50), and the ability to track progress, participants were highly engaged and at least 45% of those who saw the coupon, ended up eventually sharing it with their own social graph. Takeaway: Boost campaign engagement by including elements of gamification. Let participants track progress and design your campaign so the incentive accrues greater value as various milestones are reached. 1. The Offer: What is the incentive for your advocates to spread the word about your brand? Make sure to know your audience and what will resonate most with them. 2. The Experience: For advocates, make sharing effortless and for referred friends, make sure the landing page is personalized and reinforces your offer and the incentive that awaits them beyond conversion. 3. The Analytics: Track and analyze program performance. Optimize when necessary to drive continued participation and results. If you’re uncertain on any of the above, I invite you to review Parts one and two of the A-to-Z WOM series to help guide your thinking. If you need additional help developing your WOMM strategy, one of our social advocacy experts would be happy to assist. What will you do with WOMM in the coming year? We’d love to hear from you in the comments.